NATS has been awarded The Operational Research Society’s President’s Medal for its work on the development of a new environmental performance metric. 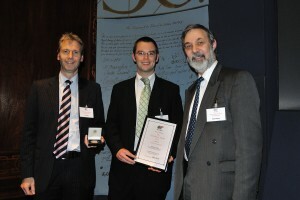 Richard Eglese (right) from the Operational Research Society presents the President’s Medal and certificate to Sean Jones (left) and Steve Hammond (centre) from NATS. The President’s Medal is one of the society’s most prestigious honours and is awarded annually for the best practical application of operational research in industry. Steve Hammond, Capability Lead for Airport Capacity at NATS, picked up the prize on behalf of the Operational Analysis (OA) team at a ceremony held at the Royal Society in London. Steve said: “We have been awarded this honour for our work to develop a new metric that enables us to measure NATS environmental performance for aircraft under our control. The metric was developed in order to demonstrate a contribution to a flight’s overall environmental performance. A key challenge in developing the tool was finding a way of stripping out inefficiencies that were being caused by others. It uses a complex calculation to compare the overall flight track of an aircraft versus the airline’s preferred flight trajectory. The new performance measure, which will be implemented from January next year, is called the 3Di score (3 Dimensional inefficiency). The judges of the President’s Medal commended the work for going beyond delivering business efficiency alone, and demonstrating the power of operational research in fundamentally shaping the business environment.